IN THE BAIT: BASS has been designed to eliminate the problem of hooks, blades and line getting tangled up, resulting in pointless casts. By making the area around the hook eye it reduces the possibility of the hook getting over around the head and in the unlikely situation where it actually does, the head is shaped so the hook comes free easily. Also by fixing the blade to a point higher than the body, on the "kick up eye", it makes the blade spin away from the line during free fall to reduce the possibility of line tangles. This all means, more effective casts and retrieves, and on top of this a chance to pick up more bites on the free-fall as well! Designed to fully realize the potential of tail spin jigs, the body uses ultra strong alloys. On top of this it is fitted with the indispensable NORIES "V Blade". The powerful flashing and vibration born from the NORIES spinner bait CRYSTAL S blade matches well with the Tailspin jig IN THE BAIT: BASS. Useful in flat areas, deep areas where fish are schooled up, and able to be used with a variety of techniques such "lift and fall" or simply retrieved at a constant pace once it has touched the bottom. Difficult techniques are not necessary. Retrieved across surface over the top of a boil is especially effective. Deep water is an obvious use; however it is also great for a wide range of depths and retrieve speeds. 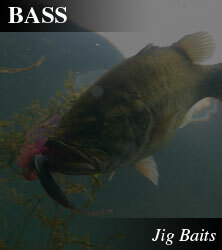 While it is small it also packs a huge appeal factor that is unique to IN THE BAIT: BASS.